On Friday, July 14, 2017, Langdale Vallotton, LLP partner William P. (“Pope”) Langdale III was sworn in by Supreme Court Justice David Nahmias as a member of the Judicial Qualification Commission (“JQC”). 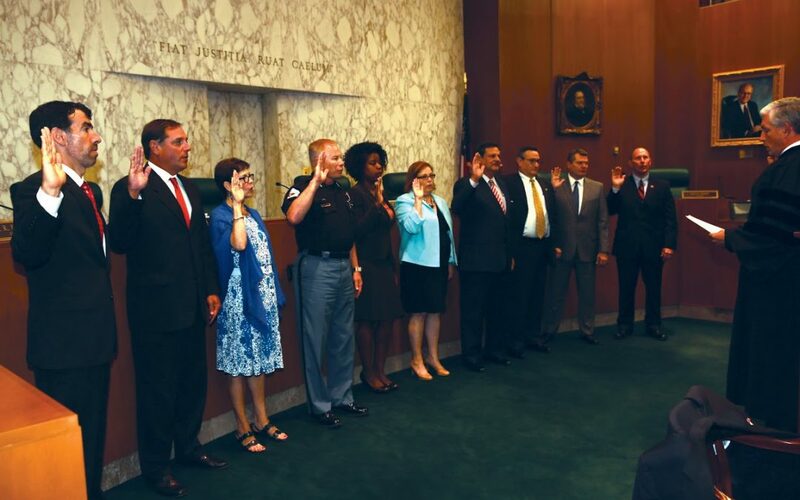 The JQC has oversight responsibility of all Judges in the State of Georgia, insuring that our Judges maintain the integrity of the Judicial Branch. It was recently reformed by the Georgia Legislature to mandate that its members are appointed by both the Legislative and Judicial Branch of State Government. It will now consist of an Investigative Panel and a Hearing Panel. Pope was appointed by the current Lieutenant Governor, Casey Cagle, to serve on the Investigative Panel. The Investigative Panel consists of two judge members appointed by the Supreme Court, one attorney member appointed by the Governor, one attorney member appointed by the President of the Senate/ Lieutenant Governor, one attorney member appointed by the Speaker of the House of Representatives, one citizen member appointed by the President of the Senate/Lieutenant Governor, and one citizen member appointed by the Speaker of the House. Pope will serve on this panel alongside Edward D. Tolley, Richard Hyde, James Balli, Warren Selby, Jr., Judge Louisa Abbot, and Judge Stacey Hydrick. The Hearing Panel consists of three members, one judge member appointed by the Supreme Court, one attorney member appointed by the Supreme Court, and one citizen member appointed by the Governor. The Hearing Panel’s members are Judge Robert McBurney, Jamala McFadden, and Michael Register.